Want a yard with green, lush, healthy grass? Dethatching can help you get there. The simple process of dethatching allows water, oxygen, and key nutrients to absorb into the grass and keep your lawn nourished and attractive. What Is Thatch and Why Is It a Problem? Thatch is a layer of dead pieces of roots and grass that is not easily penetrated. It’s a layer that lives between your healthy grass and your native soil. Contrary to popular belief, a little bit of thatch is actually a good thing. A thin layer of thatch provides protection from sun, heat, and humidity which can be damaging to grass in the summertime. Yet, thatch becomes problematic when you have more than half an inch of it. As thatch builds, it becomes packed and dense. It blocks light and prevents grass roots from truly establishing themselves in the soil. As a result, they become tangled in the dead grass. Eventually, this thatch layer creates an impenetrable barrier that also prevents water, oxygen, and nutrients from reaching the soil. Is your lawn spongy when you walk on it? When you weave your fingers through the lawn, do you notice a layer of thatch? Have you measured thatch at more than a half inch? If you’re seeing any of this evidence, it’s probably a good time to dethatch. How Do You Dethatch Your Lawn? 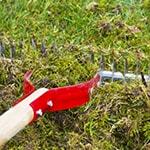 Dethatching is a process of combing your lawn to remove thatch. There are several ways to go about clearing thatch from your lawn. You can simply use a garden rake and rake away the thatch. 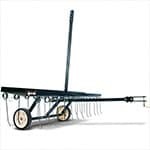 You can also find a custom-made dethatching rake that works particularly well. If you are interested in saving yourself some work, though, you can get a motorized walk-behind dethatcher. You just push it along, walk behind it, and it quickly takes care of dethatching your entire yard. Tow-behind dethatchers are also useful tools. You simply attach them to riding lawn mowers so you can cut your grass and dethatch simultaneously. You can also connect these tow-behind dethatchers to other machines like tractors. When Is the Best Time to Dethatch a Lawn? For warm-season grasses like bermuda grass, centipedegrass, St. Augustinegrass, and zoysiagrass, late spring and early summer are the best times to dethatch. Do it after you’ve mowed once or twice into the year. For cool-season turf like Kentucky bluegrass, ryegrass, bentgrass, and fescues, early spring or early fall is best. You want the grass to have sufficient time to grow and be reestablished before frost arrives. 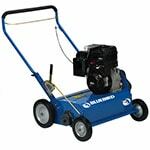 How to Dethatch Your Lawn.. Our Power Equipment Direct how-to library can help you learn about How to Fertilize Your Lawn, Vote for Your Favorite Brands in Mower Madness 2019 and Official Mower Madness Contest Rules.